The Polynesian island of Tahiti is in the imagination an island paradise, an idyllic world inhabited by noble savages, carefree and uncomplicated. Tahiti separates myth from reality. 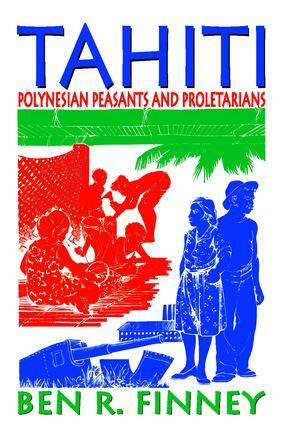 Finney describes and analyzes the forces of change that have confronted Tahiti and its inhabitants in the modern world. As the author notes in the introduction, "Neither isolation in the South Pacific, nor the romantic aura invested in them by philosophers and escapists of the West, has saved Tahitians from intense involvement in the twin processes of industrialization and urbanization." This study of Tahitian life concentrates upon two different communities. One is a peasant community moving from subsistence farming to an increased reliance upon the production of cash crops. The other is a proletarian community whose members were at the time abandoning farming and fishing in favor of wage labor. Finney compares the two contemporaneous communities, enabling him to define different but interrelated variables of the economic and social change. These are responsible for Tahiti's evolution from a subsistence oriented peasant life to a life based increasingly on cash crops and wage labor. What happens to family life, work patterns, land use, and other traditional modes of social organization when a small, underdeveloped society is confronted with economic forces largely beyond its control? In dealing with this question as it applies to Tahiti, Finney makes an important contribution to our understanding of how modernization affects a society once thought to be outside the boundaries of the modern world. A major study in English of the socio-economic forces at work in Tahiti, this book provides the reader with both an understanding of the changing nature of Tahitian life, and the reactions of Tahitians to such changes.